Details:	The bridge, spanning a deep valley, is located in tough Himalayan terrain prone to landslides. 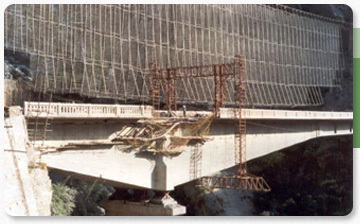 The superstructure consists of 2 unequal cantilevers of 19.8 meter and 39 meter towards centre of the crossing and balanced by suspended spans of 30.4 meter. Shore spans are 8.2 meter and 18.6 meter in length. 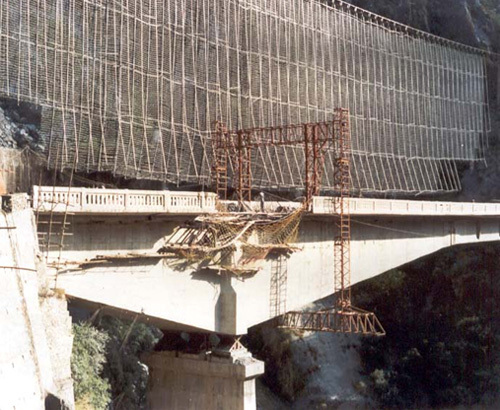 Challenge: The prestressed concrete single cell box had suffered heavy damage due to a massive landslide resulting in rupturing of 32 out of 46 cables. Solution:	The cable positions were re-established and they were coupled and anchored over a concrete block specially constructed over the pier. The damaged portion of the deck was also repaired and the cables stressed. A load test was conducted in accordance of the IRC standards.